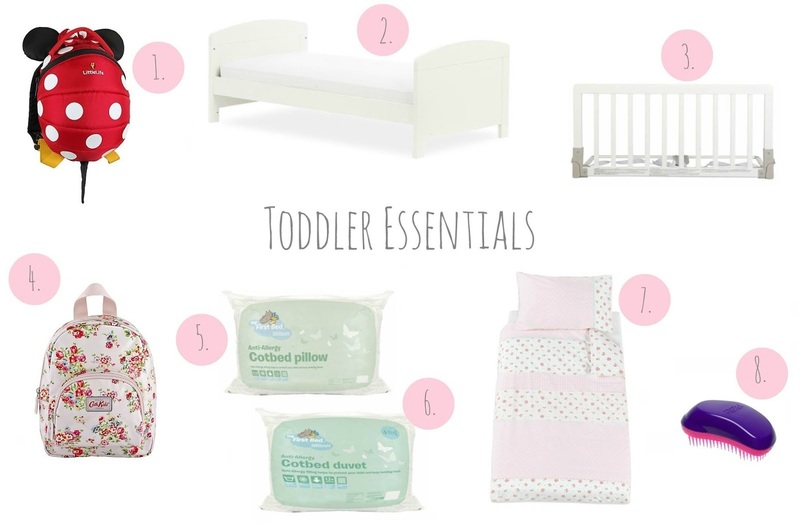 I thought I would put together a list of basic items we use now that Sophie is a toddler. Obviously they aren't all essential but they are products we use on a regular basis which we personally think are great and couldn't live without. These are a lifesaver when out and about as Sophie has the freedom she wants but it's also so much safer when we're in busy places. We chose a cotbed rather than a cot as it converts to a toddler bed, which saves the expense of buying a new bed once she had outgrown her cot. We chose this as it matches her cot and prevents her from falling out of bed. It made the transition from cot to bed a lot easier too. We use a rucksack instead of changing bag and they're so handy for days out. We usually include nappies, wipes, drink, snacks and toys etc. I chose the ones from Silent Night as I knew they would be good quality. It's also good to get a spare set too in case of any accidents or sickness. We have a few different duvet sets so we can switch them around while the other is in the wash. This is technically mine, but I use it to brush Sophie's hair everyday. If your child is anything like mine and hates their hair being brushed - then I would definitely recommend you investing in one of these! Please let me know if this post has been useful. I've been thinking of buying a tangle teezer for my girls but I find them expensive. The reigns were really helpful when my girls were younger!